Earlier this week, Pizza Hut hauled its latest pie out of the R&D oven: Grilled Cheese Stuffed Crust Pizza. It's pretty much what the name suggests—"a delicious, flavorful and indulgent pizza," in the words of CMO David Timm, "that packs the punch of a gooey, cheesy, crunchy grilled cheese." Pizza Hut also assured us that "cheese is rapidly becoming one of America's favorite foods," which is, presumably, why the brand has been stuffing its crusts with various cheese combinations for over two decades now. Pizza Hut has filled its pizza crusts not just with mere mozzarella, but with three cheeses and things like meat, Marmite and even cheeseburgers (see box below). Ever wonder where all of this began? We'll tell you: It began with Donald Trump. "Do you really think this is the right thing for us?" Trump asks. "It's wrong, isn't it?" "But it feels so right," she coos. Whether it was the cheesy TV spot or just the cheese-stuffed crust, the ad was a smash hit. 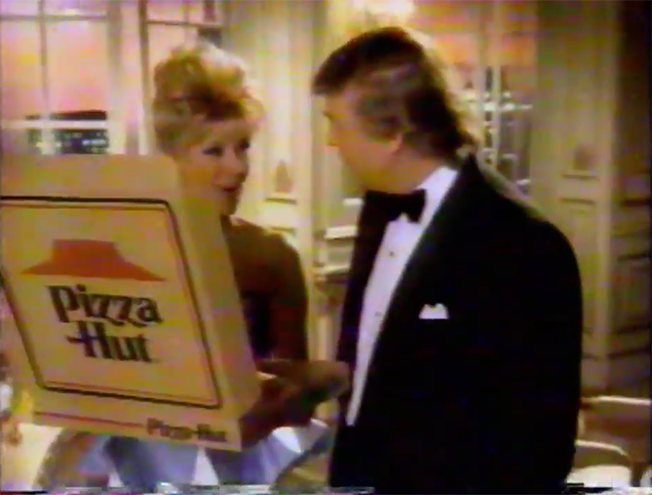 Halting a 5 percent same-store sales slump for 1994, stuffed crust helped jack Pizza Hut's sales by $300 million by the end of 1995. These days, with Trump making daily headlines for his often inflammatory remarks, it's hard to remember that 21 years ago he wasn't nearly as polarizing a figure. "He was an egomaniac billionaire and almost charming," said Hayes Roth, principal of brand and marketing firm HA Roth Consulting. "His egomania was so huge that he makes fun of himself. He's lost that sense of humor. But he put on a great show, and back then we bought it." To be sure, we bought plenty of stuffed-crust pizza, too. But Roth is correct: Donald Trump is no longer just the New York mogul who was game for a self-effacing TV spot. He's a central player in the most contentious presidential race in memory. Which is why Pizza Hut's parent company, Yum! Brands, understandably eager to retain both its red- and blue-state customers, is steering clear of mentioning its 1995 commercial. "We haven't, to this point, mentioned it, and we will not be utilizing the Republican candidate in the upcoming marketing," said Doug Terfehr, Yum! Brands' senior director of corporate communications. "But he was part of the original commercial." Another name that's rarely mentioned in stuffed-crust history is Patty Scheibmeir, the food scientist credited with developing it. In 1992, Scheibmeir bought some mozzarella string cheese at her local grocery store and rolled it into pizza dough. The rest is chain-restaurant history—or so the story goes. But is it a true story? Pizza Hut itself isn't certain. "It's like Woodstock," Terfehr said. "Everyone who was alive [in 1969] said they were at Woodstock, and anyone who worked at Pizza Hut said they were involved in stuffed-crust pizza. Obviously, it was a team thing." These days, Scheibmeir is vp of R&D for Rave Restaurant Group. And Mr. Trump? Well, he has his eye on a new job, too.